Tonally, the Goodtime Six-R is elevated by the addition of a maple resonator behind it’s 11” 3-ply violin grade maple rim. 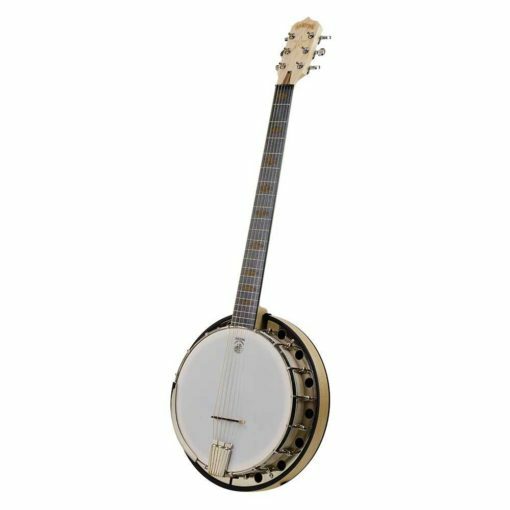 Like any banjo, the addition of a resonator not only creates a hollow sound chamber, but also provides a flat surface for the sound to bounce off and project forward towards the players audience, instead of being absorbed by their body. The result is a significantly fuller, clearer and more vibrant tone. Strings come courtesy of Elixir’s XL bronze set, while other features include 6 high quality guitar style tuners, 26 ¼” scale length, ovangkol block inlays, a Deering designed Goodtime 6 string tailpiece and frosted top head.